Macarons + Salado Winery = sweet spring fun! Y’all are invited to join in on this yummy goodness! Macarons by Maison de Macarons paired with wines made by Salado Winery. Second, sit back and enjoy the presentation by the macaron baker and the wine maker, both local gals who live in Central Texas and share a passion for all things French. Ahhh! those little pretty desserts. Did you know they are naturally gluten free? What a coincidence, so is wine! As if anyone ever needed an excuse to enjoy their Friday evening? Come on now, stop thinking about it. If you wait too long, someone else might buy your ticket….see you soon! A bientot! https://saladowinery.com/wp-content/uploads/2018/04/IMG_20180405_132430275_BURST000_COVER_TOP.jpg 448 316 June https://saladowinery.com/wp-content/uploads/2016/08/HeaderLogo_Color-1.png June2018-04-23 18:57:552018-04-23 18:57:55Macarons + Salado Winery = sweet spring fun! The event kicks off on Thursday, November 30th at 6:00 p.m. with the Christmas Parade. 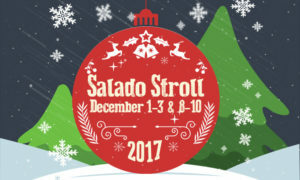 The Salado Christmas Stroll is noted for shopping all day and into the night for all the people on your Christmas List where you will find the unique and one-of-a-kind items only Salado can offer. Food and drink at local establishments and from various vendors will provide varied and delicious offerings. Music can be found in the Village and in many establishments with strolling carolers and instrumentalists. The stores are open late on Friday and Saturday. Please join us for our 2nd annual Grape Stomp and Harvest Dinner! We will have a grape stomp competition, live music and food from Hecho en Queso. We expect this event to sell out, so don’t wait to buy your tickets, or you may end up hungry and disappointed. There is no admission fee to attend the grape stomp and dinner. In honor of our 12th anniversary, our favorite wines will be on sale for $12. Tickets are for grape stompers and eaters. 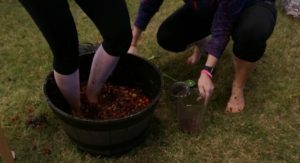 Our grape stomp will be the perfect opportunity to make your Instagram followers super jealous. Teams of two people will compete every 15 minutes. During your team’s turn, one person will stomp for two minutes and then the second person will stomp for two minutes. The team of two who produces the most juice wins bragging rights! $1/ticket will be donated to the Heart of The Vine Relief Fund, which distributes gift cards to victims of the California wine country wildfires. Tickets are non-refundable. Even if it rains, snows, sleets or whatever the great state of Texas comes up with for weather. This event will be outdoors and and under a tent. Kids are welcome and #Winerycat insists that dogs must be on a leash. Sorry, “wine tasting” will not be available during this event, just wine by the glass or bottle. 1. 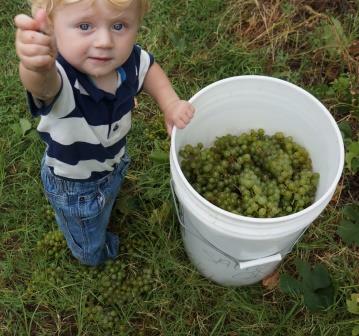 Fans of all ages are welcomed to the harvest festival, but grape stompers must be 21 or over. 2. Stomping will commence when the Stomp Master blows the whistle and all teams must stop stomping and collecting at the closing whistle. Any team who starts early or delays stopping will receive a penalty. 3. All stomping must be done with bare feet…NO HANDS! 4. Stompers must stomp in an upright position only and may hold on to team member for support. 5. Only juice will be measured, any grapes and pulp will be strained out by the judges. 6. In the event of a tie, the officials will choose the team who displayed the most enthusiasm or best costume. 7. Any team not participating in a manner consistent with fair play and good sportsmanship is subject to disqualification without refund. 8. Your slot will be during the hour you sign up for. You must be on time. If you are not present when your team is called, then you forfeit your team’s grape stompin’ tickets. 9. All participants must sign Liability Waiver. WINE & dinner PLEASE! – $17 (on NOV 10 will increase to $19) The “ummm, I’ll just watch….” This ticket includes the choice of one dinner plate and one glass of wine. 21 and over, only. SMASH THOSE GRAPES PACKAGE – $44 (on NOV 10 will increase to $49)Ticket holder is entitled to one dinner plate, one go at stomping, and one glass of wine. When you purchase your ticket, let us know the name of your partner and anyone you’d like to compete with so we can pair you together! 21 and over, only. 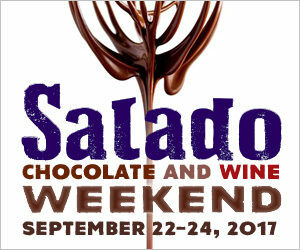 Salado invites you to its annual “Chocolate & Wine Weekend.” For those who believe the four basic food groups consist of white chocolate, milk chocolate, dark chocolate and truffles… the “Chocolate & Wine Weekend” is the event not to be missed. The event will take place throughout the Village of Salado. It’s seven great events in one fun-filled weekend! Friday evening, September 22nd “Evening of Chocolate & Wine” from 7:00 PM to 9:00 PM at the Salado Winery Company. Premier Salado wines will be paired with decadent chocolates. 21 & over. Reservations must be made in advance, as this event sells out. Seating is limited to 50 people. This is a ticketed event for $44.95 per person and tickets can be purchased through EventBrite.com or at the door if they haven’t sold out online. Saturday, September 23rd – 3 Course Lunch at Alexander’s Distillery from noon – 3:00PM. Smoked Chicken Stuffed Jalapenos with Oaxaca Mole Sauce. Ancho Cocoa Rubbed Brisket with Dark Chocolate BBQ Sauce served with Refried Beans, Cilantro Rice and Grilled Flour Tortillas. Chambord Chocolate Mousse Martini with Fresh Berries. Tickets are $25.00 and must be purchased online. The event continues Saturday, when you take part in our “Chocolate & Wine Trail” from 1:00 PM – 6:00 PM throughout the Village of Salado. Use your Passport and follow the signs to guide you and ride the trolley to follow around this “trail of sweet chocolate dreams” featuring multiple stops around the Village. 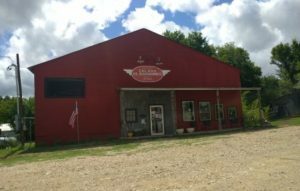 Some stops feature wine and other stops featuer a fun chocolate experience. 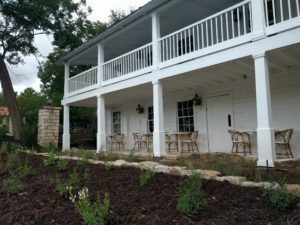 When you arrive in Salado, your first stop will be the Visitor Center to check in and receive your “Chocolate & Wine Trail Passport” and complimentary wine glass. It is very important that you pick up your Passport, wine glass, and wine tickets before the event starts. Your Passport is your entry into each of the locations. 21 & over. Tickets are $29.95 per person and must be purchased in advance at EventBrite.com. Dress Code: Dress comfortable. Our downtown area is a mile long so you will probably want to wear comfortable shoes if you plan on walking to each location. There is plenty of parking along the downtown area for those who are driving instead of walking. Enjoy “Death By Chocolate Contest” presented by the Friends of the Salado Public Library. This will be held at the Salado Public Library, Saturday from 3:00 PM – 5:00 PM. Enter your favorite chocolate recipe and you might win! Entries available at the library. For more information please call 254-947-9191. End your day dining at The Range at the Barton House for a special “Chocolate and Music” dinner featuring wine from 7:00 PM – 9:00 PM. Guests should arrive and be seated by 7pm for a prompt start at 7pm. The four-course menu is sure to please every palate beginning with the first course of cauliflower puree, chocolate nibs and white chocolate crema. The second course features frissee, cocoa smoked beef tenderloin, manchego and butter toasted hazelnut vinaigrette. The third course consists of grilled quail mole, roasted garlic mashed potatoes and asparagus. The final course of sweet endings includes options of cinnamon chocolate espresso cheesecake and tart cherry sauce. This is a ticketed event, limited to 32 guests at $59.00 per guest. Tickets must be purchased in advance at EventBrite.com. On Sunday, September 24th, before you make your way home after this unique event, make plans to enjoy a fabulous Brunch at Alexander’s Distillery. 10:30am – 2pm. Charcuterie Platter. Peking Duck Carpaccio with Cocoa Nibs. Ancho Cocoa Rubbed Barbecue Brisket Hash with Eggs. Chambord Chocolate Mousse. $25 per guest. Purchase tickets online. Come pick grapes with us at the vineyard at 21724 Hill Road, Salado, TX! You can even eat some straight from the vine! Harvest is family friendly. Wear comfortable, cool clothing and tennis shoes. You’ll want to bring a hat, sunscreen, water, and bug spray. We’ll provide everything else you need. We will start bright and early at 7am and go until all the grapes are picked….#Wineryboy has been picking grapes since he was 1! Hecho en Queso will be at the vineyard offering breakfast tacos for sale. After harvest in the morning, you can join us at the winery to watch grape processing. The grapes will be de-stemmed and crushed using machines then prepared for fermentation. By late afternoon we will add the yeast and alcohol formation begins! 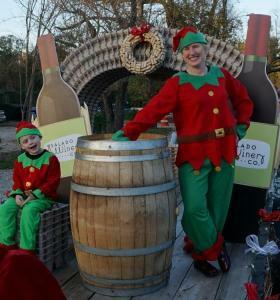 Salado Chamber of Commerce and Tourism Bureau invites you to its annual “Salado Swirl” held throughout the Village of Salado. New this year – complete the entire trail and you will be entered for a chance to win a cruise for 2. Complements of Journey’s Travel Associates. Tickets and more information are available at the link below. STOP by Salado, TX and check out all the new energy! 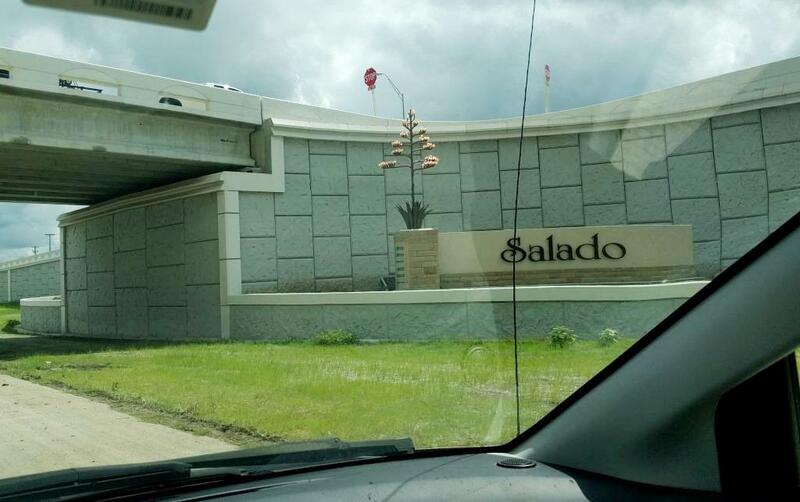 Have you been by Salado lately, if not, then you definitely need to come by and check out the NEW IMPROVED version we’re sporting! First off, the construction is finished! Yay!! Now it is super easy to get to our winery. On top of that, the new highway looks great. You know how nice new construction always looks? This project has really come together. One of the biggest highlights is that there is a stagecoach mural and it is right near the winery. Speaking of “stagecoach” the biggest news in town is that the Stagecoach Inn Restaurant is open! The food is fabulous, the decor is beautiful and the service cannot be beat. It is a wonderful blend of classics and modern, both on the menu and throughout the building. I recommend you make a reservation, but even if you aren’t hungry, stop by the bar to have a drink and soak up the ambiance. Click here for some pictures from our dinner. And if you’re looking for something new and different, check out the cool new e-bikes at LoneStar eBikes. Howling Wolff moved a few doors down into a gorgeous new location and LoneStar e-bikes moved into Howling Wolff’s old spot. So lot’s of changes, new businesses and shiny re-builds. To keep up with the fun things in Salado, we recommend you follow “Keep Salado Salty“. They love to promote all of Salado’s goodness. And don’t forget our favorites: Salado Glassworks, Barrow Brewing & Classics on Main. Have a great summer! https://saladowinery.com/wp-content/uploads/2017/07/IMG_20170628_110645_1-1.jpg 643 1024 June https://saladowinery.com/wp-content/uploads/2016/08/HeaderLogo_Color-1.png June2017-07-05 18:30:282017-07-05 18:30:28Salado Re-INVIGORATED! Situation: Ignorance is the enemy of public arts. We have created this exercise in order for YOU to help US inform the Citizens of Central Texas and beyond of the fantastic public art available in the Village of Salado. “Artists in Action” Bob Ragan and Matthew Johnson, will be on site at each Camp working on current projects. Feel free to chat with the artists and learn more about their craft. The Village of Salado is located at 30°57′19″N 97°32′05″W along the Balcones Fault Line which causes surface waters to erupt in this limestone-rich area of Texas. Maintain caution along water crossings. Native wildlife include armadillos, squirrels, and an abundance of deer. The local population is considered friendly, but we warn you not to engage them on the topic of deer overpopulation. Your mission is to recon each public art installation, document it photographically and share the experience on your social media platform(s) of choice using #artattacksalado. When you arrive at your end point, you will show the pictures in order to earn your second round of rations. Execution: All 10 points of interest are shown on map on opposite side. 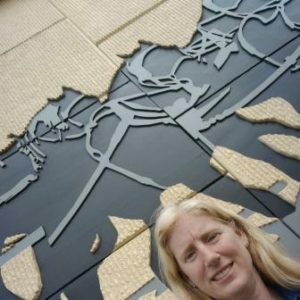 At each public art location, photograph a “selfie” to prove you documented it. Don’t be a Blue Falcon, help each other find the points of interest. Want to go above and beyond? Aim High? Get a selfie with all 10 of the sculptures listed on the OPORD and be entered for a chance to win the ultimate bag of swag from Salado Winery and Barrow Brewing. Logistical support: Adult tickets will include 4 samples of beer along with an MRE inspired snack from the Pig & Pickle and 4 samples of wine paired with a chow hall inspired snack. Kid tickets are meant for the little ones and will include a juice box and a cookie. Command/Signal: OPSEC isn’t an issue with this Recon! 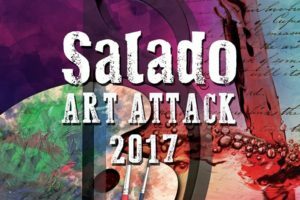 Use hashtag #artattacksalado to post photos on social media. Your carriage awaits! Imagine the romance of celebrating with your sweetheart at Salado Winery Company. 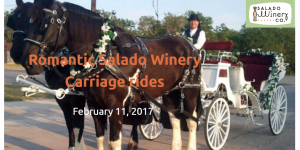 Saturday, February 11th, you and your partner will each enjoy a glass of your choice of wine made at Salado Winery while you ride in a romantic horse-drawn carriage down Main Street, Salado in celebration of Valentine’s Day. $47.95 per couple includes a personal tour of the winery, two glasses of wine, and one carriage ride up and down Main Street. Carriage ride is provided by Clydesdale Carriage Company. You only need one ticket per couple. Please arrive 15 minutes in advance of your booked time so that we can take you and your date on your personal tour and serve your glasses of wine. The carriage cannot wait for late lovers as it will be booked continuously throughout the afternoon. In the event of light rain or fog, the carriage has a roof to keep the riders dry. Naturally, you and your partner must be 21 to consume wine, please bring IDs.